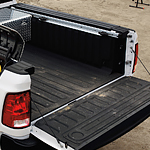 The durability and reliability of the Ram 2500 are some of the qualities that keep the heavy-duty pickup on the list of favorites among truck owners. The latest models feature impressive interiors that have an upscale design. But, the materials used ensure the truck is more than capable of work. Take one of our 2019 models for a drive by visiting our Woodhouse Chrysler Jeep Dodge RAM location. The interior features two-tone styling based on the color of the seating upholstery. The vinyl used to cover the seats is work grade tough, which makes it durable. Yet, some colors mimic rawhide leather. The center console, door panels and steering wheel feature matching trim. Add some wood trim to create a more luxurious appearance. There is plenty of interior storage space thanks to the amply-sized center console compartment, the glove compartment and the rear seat under-floor storage compartment. Pack commonly used tools, a change of clothes or anything else you might need.